What does November mean to you? 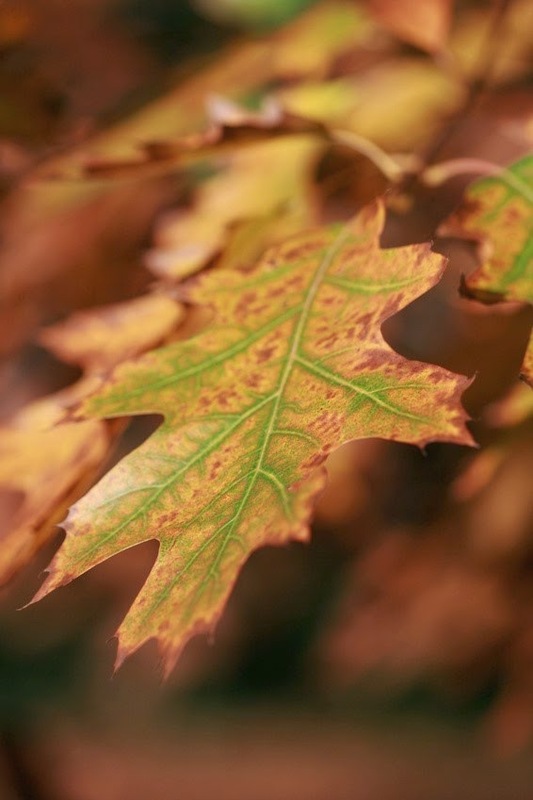 To me it represents the REAL beginning of fall (partially because in Phoenix it's the only time it’s not hot ;-)), the cooler weather and one of the most amazing holidays. Thanksgiving to me means delicious food and precious time with family, friends, and loved ones…. Irreplaceable time! J Be sure to cherish every minute with those you love and tell them how special they are to you! I have many fond memories of sitting around the table laughing with family and friends…. It’s a time to catch up on what the year may have been like for you or just reminisce on what has transpired in the past… either way I’m definitely more thankful each and every year!!! As an orthodontic office we LOVE Thanksgiving because most of the food items are “bracket and appliance” friendly so we encourage you……. EAT UP!!!! Braces should not hinder the pure deliciousness that is Thanksgiving!!! ***Do you know the history of Thanksgiving???? It’s actually very interesting! Here is what Wikipedia says about it…..
“Thanksgiving, or Thanksgiving Day, is a holiday celebrated in the United States on the fourth Thursday in November. It became an official Federal holiday in 1863, when, during the Civil War, President Abraham Lincoln proclaimed a national day of "Thanksgiving and Praise to our beneficent Father who dwelleth in the Heavens", to be celebrated on the last Thursday in November. Also, there are reports that the original Thanksgiving proclamation was signed by George Washington. As a federaland public holiday in the U.S., Thanksgiving is one of the major holidays of the year. 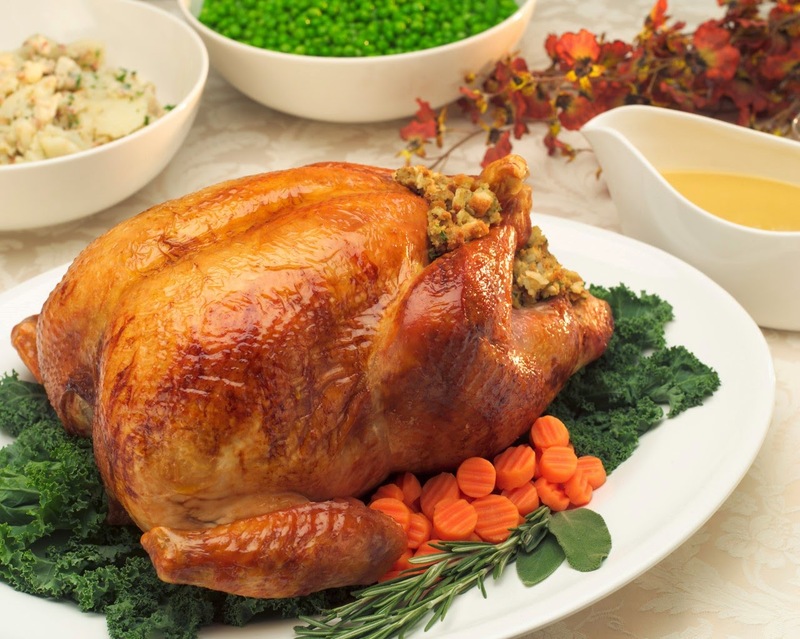 Together with Christmas and New Year, Thanksgiving is a part of the broader holiday season. **We hope that you have an amazing November and enjoy the upcoming holidays, weather and time with your loved ones!! 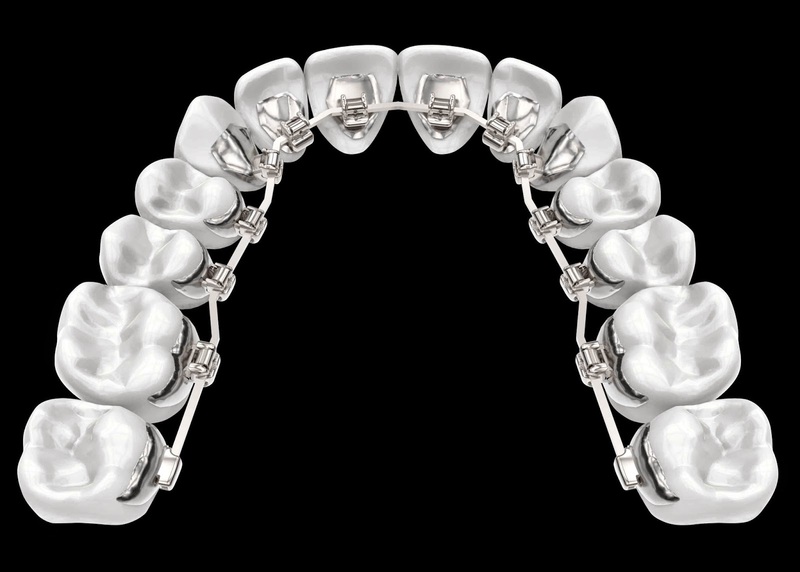 This awesome photo is courtesy of the American Association of Orthodontists!!! Here are some positive and TRUE facts about orthodontics, If you keep your teeth and braces clean, come to every visit you need and follow all of our instructions- not only does it not "hurt" but it doesn't take "forever"!!! 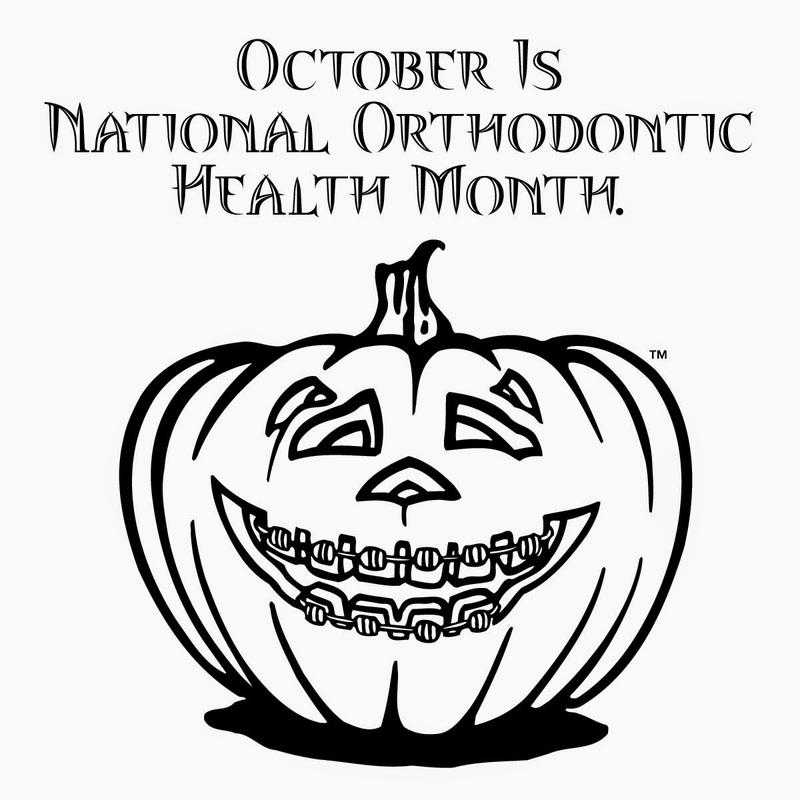 Ultimately the goal of National Orthodontic Health month is to not only promote a healthy mouth but a more pleasant approach to orthodontics!! *Interfere with proper chewing which in turn can cause digestive issues. *Make cleaning your teeth more of a challenge, increasing the risk of tooth decay, cavities, and gingivitis. *Strain the teeth, jaws, and muscles, increasing the risk of breaking a tooth or causing pain in the jaw joint itself. *Make people feel self-conscious about their appearance and affect their self-esteem which causes them to smile less. If you are struggling with any of the above concerns, we would LOVE the opportunity to discuss how we can help with you! Since October is National Orthodontic Health Month we thought we would share a Halloween recipe that you CAN eat with braces on!!! food coloring to dough until you achieve a nice deep green color. 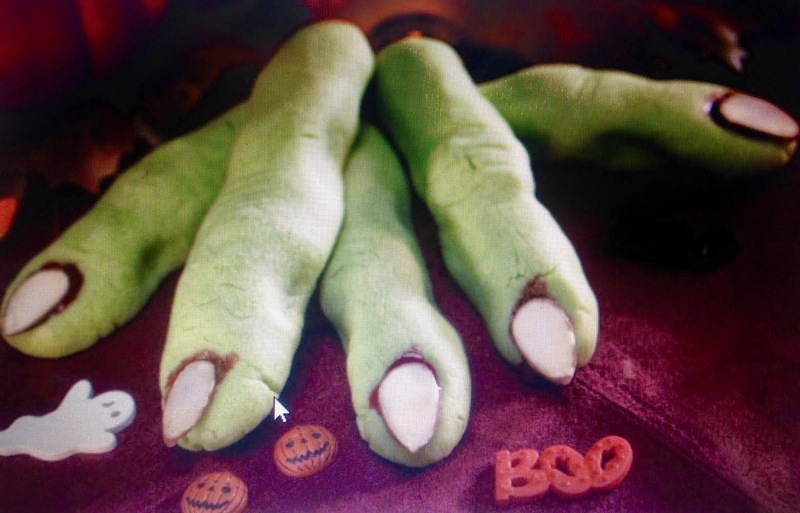 the tip of each finger and gently press an almond sliver on top so the gel oozes out from underneath. Remove cookies from baking sheets and let them cool on wire racks. Then serve and enjoy! 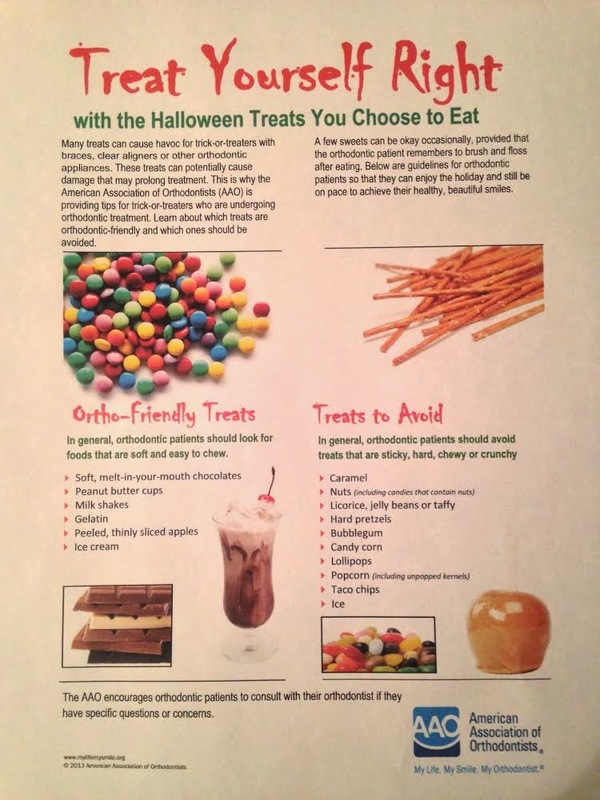 Here is a list of Orthodontic do's and don'ts on Halloween from the AAO. I was reading an article recently from Emily Lockhart of Activebeat.com about the 10 worst foods to feed your children..... and here is the kicker..... these are foods that are marketed to the public as "healthy"! Emily Lockhart is a weight loss expert who specializes in healthy living. She is dedicated to providing health-conscious individuals with the information they need to make great lifestyle choices that will make them look and feel better. In her spare time, Emily teaches Pilates at a local studio and enjoys activities like hiking, rowing and biking. Here is the list she compiled with our thoughts added. Nutritionists attest that most fruit snacks are actually candy masked in a health label—and no, “fruit juice” doesn’t count. Instead the experts recommend fresh fruit or dried fruit to achieve the same "snack" result. Lets face it..... we have ALL heard the reasons why soda is bad for you.... it causes tooth decay and is loaded with artificial sweeteners that are bad for you... enough said! Wow this one shocked us.....the reason this one is not "healthy" is that it is made from processed white flour, full of preservatives and unhealthy oils. It makes sense though....who knew! This one frustrates me....food experts say that they are packed with sugar, lack fiber and lack vitamins because they are void of any quantifiable juice. We agree with Emily- a nice fruit smoothie is much healthier and plus more fun to drink (depending on how you present it to your kiddo). We are saddened by this one and disagree to an extent..... Emily claims that delivery pizza is unhealthy but depending on what and how you order its not too terribly bad in our opinion. Her point is that using fresh ingredients at home is better and healthier... to that we DO agree. However it does defeat the purpose if the reason you are ordering is because you are too tired to cook- hmmmm what a dilemma! Well...... we all know that fried food is definitely not healthy but we do agree with Emily that moderation is key with this one!!!! We are aware that they offer very little nutritional value and are very high in fat and sodium (isn't that what makes them yummy). This also includes potato chips and other fried snack food- (I know we are bummed too)....However we also feel that opting for baked chips and to bake your own french fries is a much better way to get your fry fix! Twinkies and Hoho's are bad and not nutritious???? BUMMER!!! They are loaded with trans fats which as we know is the most unhealthy fats out there...... We agree with Emily this is another time when supplementing with some fresh fruit in the lunchbox is a better idea! This one is definitely a staple in our kiddo's lunch box..... however, iwe may be giving our children toxic food.. make sure that the meats do not contain Nitrates.... Nitrates have been used in food processing and shown to increase the risk of heart disease and cancer. Scary!!!! This one is tricky.... store bought granola bars are loaded with chocolate chips, marshmallows candy, high fructose corn syrup and artificial dyes which in turn makes them about as healthy as 2 cookies..... Emily suggests whipping up a batch of homemade energy bars with natural ingredients like almond or peanut butter, raisins, coconut, whole grain cereal, honey, and dried fruit and nuts. Thanks for the great recipe Emily!!! They sound very delicious and ACTUALLY HEALTHY. Sure, that box of Cinnamon Toast Crunch or Captain Crunch might boast a boatload of vitamins and minerals on the label, but when you consider the amount of sugar and processed ingredients per serving, the miniscule amount of nutritional value they offer doesn’t count for much. Nutritionists recommend that when you shop for a suitable cereal for your breakfast table, go for brands that contain at least 3-grams of fiber per serving and less than 10 grams of sugar. The best morning cereal that you can get your kiddo hooked on is whole grain oatmeal, it’s high in fiber, vitamins, and minerals, and you can sprinkle on some berries and mix it with yogurt, or a dab of honey or real maple syrup. The moral of this story and our take away message is that buying fresh, cooking at home and READING the fine print is crucial to giving our children the best that we can and trying to help them maintain a healthy lifestyle. ***LETS NOT FORGET THAT PHYSICAL ACTIVITY IS JUST AS IMPORTANT AS DIET..... LET'S ALL PUT DOWN OUR PHONES, TABLETS, IPADS AND GAMING SYSTEMS AND GO OUTSIDE- MAYBE THROW A BALL, PLAY A GAME OR TAKE A NICE HIKE! 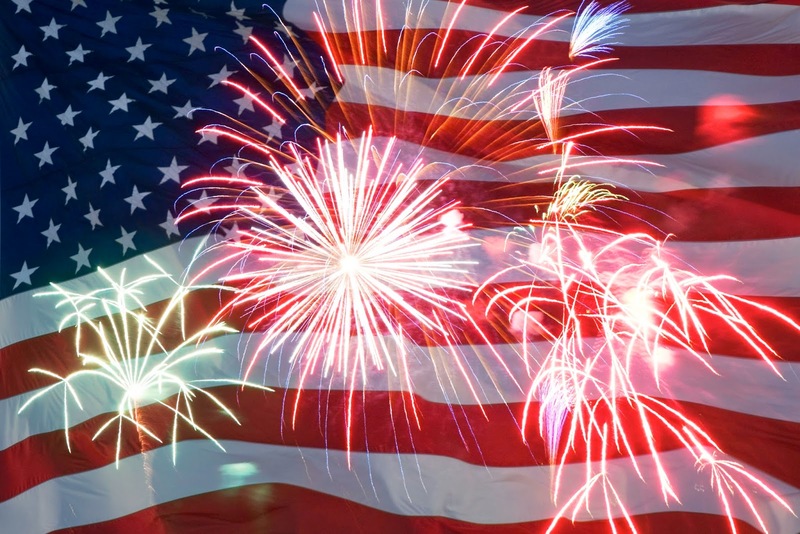 What does Fourth of July Mean to you? 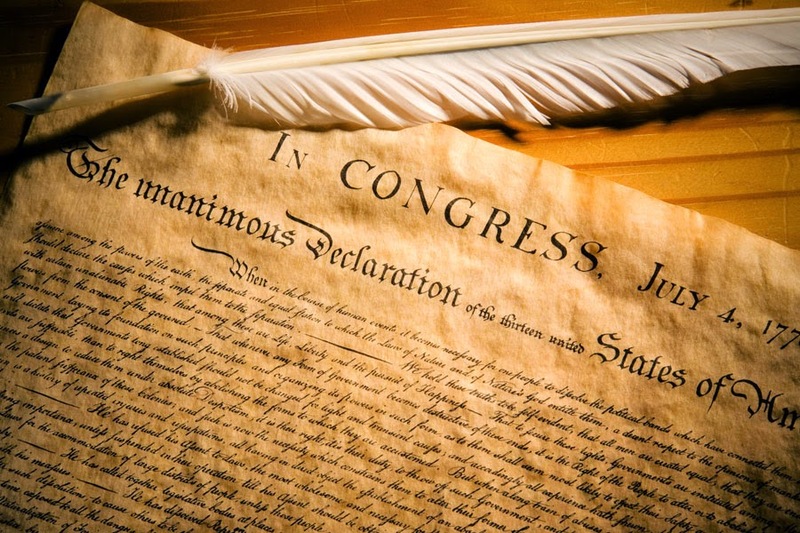 Well let’s first start off this awesome topic with…….. What is Independence day? Wikipedia says…….Independence Day, commonly known as the Fourth of July, is a federal holiday in the United States commemorating the adoption of the Declaration of Independence on July 4, 1776, declaring independence from the Kingdom of Great Britain (now officially known as the United Kingdom). Independence Day is commonly associated with fireworks, parades, barbecues, carnivals, fairs, picnics, concerts, baseball games, family reunions, and political speeches and ceremonies, in addition to various other public and private events celebrating the history, government, and traditions of the United States. 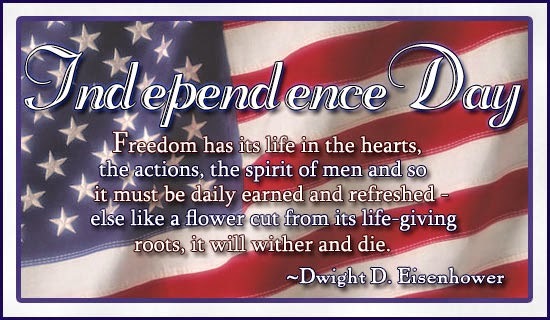 Independence Day is the National Day of the United States. To us the Fourth is a time of remembering ALL the historic figures and “just normal guys” throughout the years that have achieved great things for our country!!! So….. on this great holiday, we are thankful for the people that have served in our armed forces protecting and fighting for our AMAZING country!!!! We are thankful for our political figures throughout the many many years that support the core values of this country and enforcing them!!! We are FOREVER indebted to ALL of these people!!! THANK YOU!! Let's all take a few moments during this holiday to REMEMBER WHY while we are enjoying picnics, barbecues, reunions with relatives and time spent with our loved ones!!! 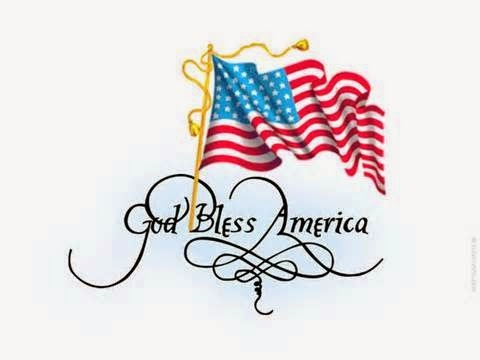 Let's all celebrate the RED,WHITE AND BLUE American pride this year!!!! 10 things you don’t know about Dr. Blue! The band had four of the most gifted musicians in history. They could play any style of music they wished to play. They led the British Invasion and infinitely influenced music and society. The band is as popular today as they were in the 70s. Modern musicians use their methods and style in present day music. All four went on to have successful solo careers after the Beatles disbanded. Paul and Ringo continue to write impactful music to this day and sell out wherever they perform. He started playing guitar 2 1/2 years ago and wishes he had started when he was a young kiddo! He escapes into his own world while playing and loves every second of it (although his playing is a bit rough at this point :)). He recommends that everyone gets involved in music. He will make sure his kids start while they are young. Music is therapy as far as Dr. Blue is concerned. He is also a prosthodontist, and practiced prosthodontics prior to pursuing orthodontic training. Prosthodontics is the dental specialty that deals with teeth replacement, occlusion (bite), and complex restorative treatments. His combination of skills allow him to maximize his patients' esthetics and function. His favorite place to do so is southwest Colorado around Ouray and Telluride. 5-Where was Dr. Blue born? Dr. Blue was born in Alexandria, Louisiana and raised in Dallas, TX. He would love to explore his ancestral roots in this region. A few of his favorites are Jaws, Pulp Fiction, Young Frankenstein, and Sideways. 8-Dr. Blue loves to cook. In fact, he almost went to culinary school instead of dental school. He is glad that he pursued orthodontics as a career and that cooking remained a hobby. As a professional chef, he would not have been able to enjoy his existing life balance due to extremely long and late hours demanded of chefs. 9-How many years of education does he have? Dr. Blue has attended 15 years of schooling after high school, including a BBA in Marketing from U. of TX at Arlington, pre-dental sciences at U. of TX at Arlington, DDS from Baylor College of Dentistry, Master of Science and Prosthodontics certificate from Baylor College of Dentistry, and an Orthodontics Specialty certificate from The U. of Nevada. Lots of them! Too many to name. He and his family can often be spotted at Postino, Joyride, Ocean Club (special occasions), and Cheesecake Factory. We know that brushing your teeth can be a challenge with or without braces. One of the questions we get frequently asked is what type of toothbrush should I use? 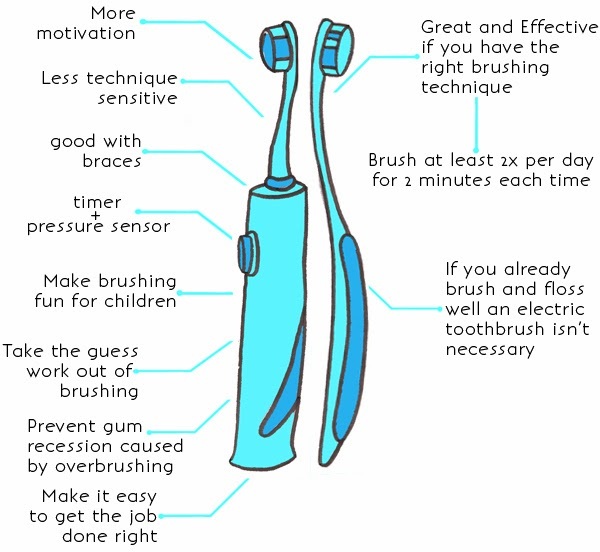 Blue Orthodontics supports both types of toothbrushes. Your decision should be based off of your specific situation. The diagram below describes why you should or should not use an electric toothbrush. The two most popular electric brushes out on the market are Sonicare and Oral B. The important thing to remember when using an electric toothbrush is that they typically have their own “technique” on how to use them. Using them incorrectly can lead to damage of the tissue in the mouth. We love to see clean mouths..... so remember- make sure you brush and floss before you see your dentist or orthodontist!